This is the most secure method to make payments for products or services online. Isle of Wight, Isle of Man, Scilly Isles, Scottish, Highlands, Scottish Islands, Northern Ireland. And batteries to these locations. You can track your order by clicking the "View order details" link on the listing that you're receiving. Please allow up to 24 hours for order processing. We work hard with all of our customers to ensure that they are getting an excellent shopping experience. We go one step further and offer a. Pre paid return label so its as easy as printing a label and dropping your parcel off at your local post office or convenience store. Communication is KEY to helping us give you the best experience. We will do our best to turn any less than satisfactory experience into a positive one. 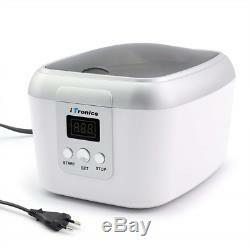 Overview If you are looking for an efficient, reliable ultrasonic unit then the iTtronics Ultrasonic Cleaner is the product for you. 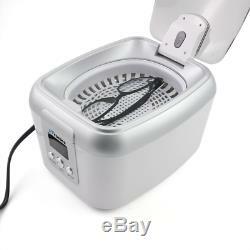 This ultrasonic cleaner makes it easy to clean items like jewelry, eyeglasses, waterproof watches, silverware and more! Easy to Operate Simply fill the tank with water and get professional cleaning results in just few minutes. With 42,000 Hz ultrasonic energy waves per second, the vibrations created by the device leave a sparkling shine on even the most stubborn jewelry. 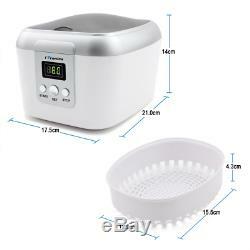 Digital Display with 5 Cleaning Cycles The iTtronics Ultrasonic Cleaner is extremely easy to use with its 5 convenient time settings. Choose from 90, 180, 300, 480 & 600 seconds with the press of a button. Features a clear-view window so you can see its cleaning power in action, and then automatically power off to conserve energy. 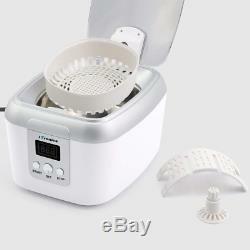 Environmentally Friendly Cleaning The iTtronics ultrasonic cleaner uses no harsh chemicals to get your personal items super clean. Just add warm tap water to the tank, select the amount of time to cycle the cleaner, and the system will ultrasonically remove residue and debris from any of your personal items. Applications: Jewelry and Watches: Necklaces, Earrings, Rings, Bracelets, Coins, Watch Straps and Bands, etc. 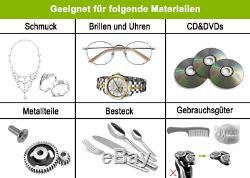 Eye Care: Glasses, Sunglasses, Contact Lens Accessories Daily Personal Care: Combs, Toothbrushes, Table-wares, Keys Features Internal blue light feature so you can see your items being cleaned. Stylish Design Perfect for Home-use Easy to read digital timer Clear view window Cleaning cycles with LED readouts Material: Stainless Steel Volume Capacity: 600ml Wattage: 35 Watts Color: White, Silver Item Weight: 1.3kg Package Contents: 1 x Ultrasonic Cleaner 1 x Basket 1 x Watch Holder 1 x Spindle with Spacer Ring 1 x Instruction Manual - Safely cleans dirty, discoloured or tarnished jewellery, eyeglasses, and watches, CD's /DVD's, utensils and more in a matter of minutes using water. Generates 42,000 Hz of ultrasonic sound waves for a powerful yet gentle clean that won't damage your valuables. Extremely easy to operate with 5 pre-set cleaning cycles (90, 180, 300, 480 & 600 seconds), with an automatic shut-off feature to conserve electricity. Easy to read digital display, quiet and portable, it is easy to store and very convenient to use. 600 mL / 0.6L capacity, CE & RoHS Certified, safe and environmentally friendly. 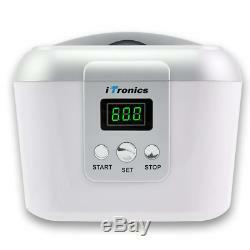 ITronics Ultrasonic Polishing Jewelry Cleaner with Digital Timer for Eyeglasses. We go one step further and offer a FREE pre paid return label so its as easy as printing a label and dropping your parcel off at your local post office or convenience store. 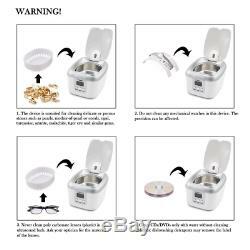 The item "ITronics Ultrasonic Polishing Jewelry Cleaner with Digital Timer for Eyeglasses" is in sale since Sunday, February 17, 2019. This item is in the category "Home, Furniture & DIY\Household & Laundry Supplies\Cleaning Products & Supplies". The seller is "premium_rated_products" and is located in Belper. This item can be shipped to United Kingdom, Antigua and barbuda, Austria, Belgium, Bulgaria, Croatia, Cyprus, Czech republic, Denmark, Estonia, Finland, France, Germany, Greece, Hungary, Ireland, Italy, Latvia, Lithuania, Luxembourg, Malta, Netherlands, Poland, Portugal, Romania, Slovakia, Slovenia, Spain, Sweden, Australia, United States, Canada, Japan, New Zealand, China, Israel, Hong Kong, Norway, Indonesia, Malaysia, Mexico, Singapore, South Korea, Switzerland, Taiwan, Thailand, Bangladesh, Belize, Bermuda, Bolivia, Barbados, Brunei darussalam, Cayman islands, Dominica, Ecuador, Egypt, Guernsey, Gibraltar, Guadeloupe, Grenada, French guiana, Iceland, Jersey, Jordan, Cambodia, Saint kitts and nevis, Saint lucia, Liechtenstein, Sri lanka, Macao, Monaco, Maldives, Montserrat, Martinique, Nicaragua, Oman, Pakistan, Peru, Paraguay, Reunion, Turks and caicos islands, Aruba, Saudi arabia, South africa, United arab emirates, Ukraine.